Click on FIND > My Content. Here you'll find your recently saved items. Now, add each feed to a new folder. Within this folder, Post Planner will score through the 5-star rating system. 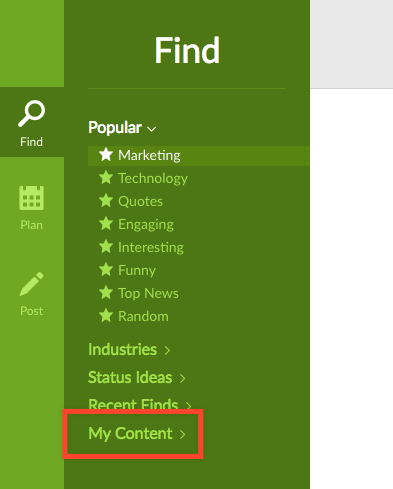 Create your own folder under "My Content" by choosing the +. Then click and hold (drag and drop) the newly saved feed to drop it into any folder of your choice. You can also move any content feed from your custom created folder to another folder by dragging and dropping it into that new folder. You can also delete any feed by clicking the 'x' icon in front of any of your feeds.